Defense legislation lawmakers agreed to this week would let commanders authorize troops to carry guns on military bases in the U.S. The legislation — which President Obama plans to veto over an unrelated issue — comes just months after four Marines and a sailor were shot and killed in a shooting at two military facilities in Chattanooga, Tennessee. The gunman, Muhammad Youssef Abdulazeez, was killed by police in a gunfight. A fact-sheet released recently by the House Armed Services Committee, headed by Rep. William “Mac” Thornberry, also referenced the June incident at Little Rock Air Force Base, Arkansas, where an armed man was shot and killed after crashing his SUV while trying to break into the installation; the 2009 shooting at Fort Hood, Texas, in which 13 people were killed and more than 30 injured; and the 2014 shooting at Fort Hood, in which four people, including the gunman, were killed and 14 were injured. “Tragic domestic attacks on DOD personnel, including those at Little Rock, Chattanooga, and Fort Hood, convinced Conferees that a one-size-fits-all force protection standard for domestic installations is inadequate, especially where carrying personal firearms is involved,” the document states. Some officials, including former Army Chief of Staff Gen. Raymond Odierno, have warned of “over-arming” troops. The issue has come up during the president debate. 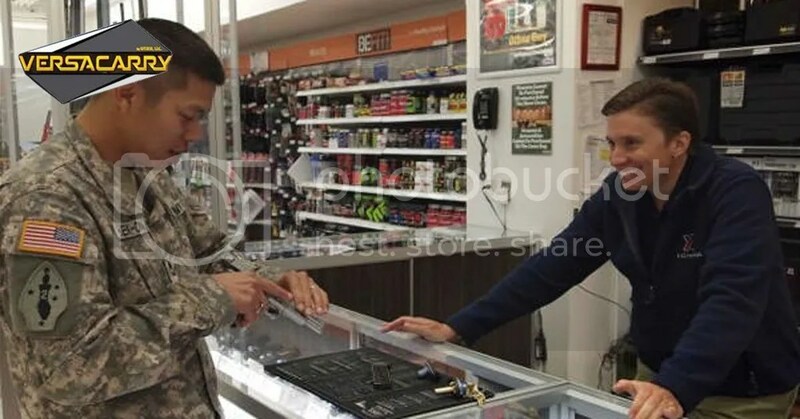 Sen. Ted Cruz, a Republican from Texas and a presidential candidate, has said troops should be allowed to carry their own concealed firearms on base. “I think it’s very important to have a public discussion about why we’re denying our soldiers the ability to exercise their Second Amendment rights,” he told a group of about 120 gun owners at a hunting club in April in Litchfield, New Hampshire, according to Politico. Military spouses who commented on Military.com’s SpouseBuzz Facebook page were split on whether arming troops on base is a good idea. Those who favored the proposal agreed that personnel carrying a firearm on post should have a permit to do so. Others worried the change could lead to greater risk. Most Americans favor stricter gun control laws, according to a recent survey by the Pew Research Center. About 85 percent favor background checks at gun shows and private sales, 79 percent support laws to prevent the mentally ill from buying guns, 70 percent favor a federal database to track gun sales and 57 percent support a ban on assault weapons, according to the organization’s poll of 2,002 adults conducted from July 14 to July 20. The House of Representatives plans to vote on the bill today, though President Obama has threatened to veto the bill because it would add tens of billions of dollars from the base budget to the war budget to skirt federal spending gaps. arry guns on military bases in the U.S.